Print pages or laminate and use with a dry erase market for durability. For many of these you will want some manipulatives like paper clips for kids to mark their answer. 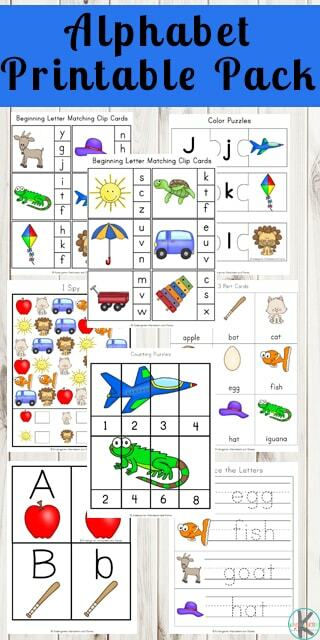 By laminating, these activities are reusable again and again by various students. Alphabet Cards – Cut out, laminate and match the lowercase and uppercase letters together. It can also be used to practice spelling beach-related words. 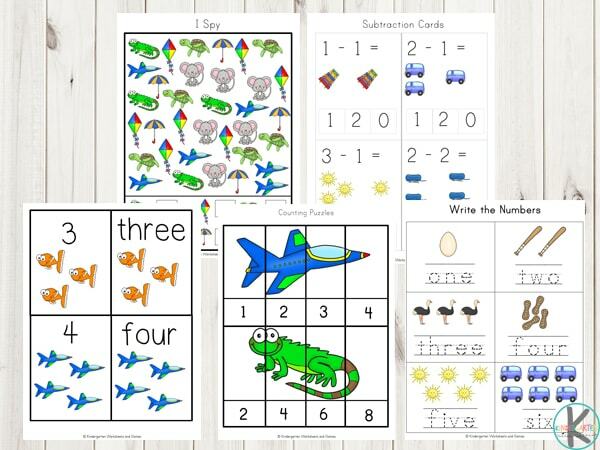 Number Cards – These can be used to match the word to the number. Trace the Letters to improve handwriting skills while learning to spell. 3 Part Cards – These cards can be used to match the words to the picture or in playing games such as memory. These can also be used together with the alphabet cards to spell out the words. I Spy – Count the objects while improving counting skills. 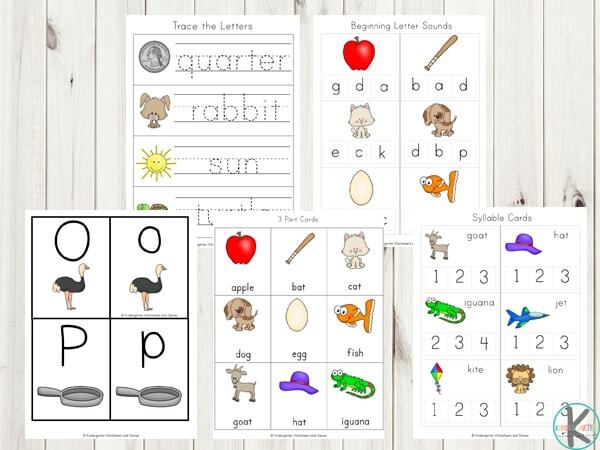 Beginning Letter Sounds – Cut out, laminate and use a manipulative to mark the correct answer. Counting Puzzles – Prepare and place the puzzles back together. Addition Cards –Mark the correct answer with the manipulative of your choice. Subtraction Cards – Put a manipulative onto the correct answer. Size Sequencing Cards – Place in order from largest to smallest or vice versa. What Comes Next? – Cut & paste the answer on the correct spot. Finish the Patterns by cutting and pasting the answer in the correct spot. Do-A-Dot Letter Activity – Using a bingo dot marker mark all the correct letters. Dice / Graphing Activity – Cut out the dice and glue together then roll the dice and graph each object the dice lands on. Creative Writing Pages –Write a story about the pictures shown. Write the Numbers –Write numbers from one to twelve. Beginning Letter Matching Clip Cards –After preparing, look at the picture and clip the correct matching letter. 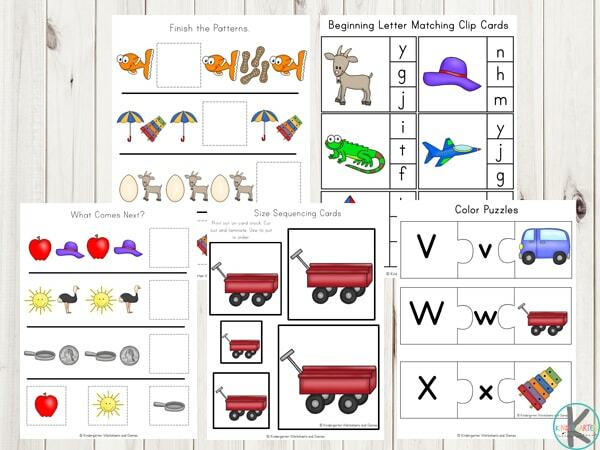 Alphabet Puzzles– Cut out and match the 3 pieces of the puzzle to practice letters and their sounds. Coloring Pages –have fun coloring the alphabet pages.